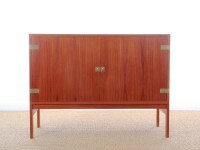 In 1952, trained as a cabinetmaker, he works together with Ludvig Pontoppidan. In 1955, he graduated from the Kunsthandvrerkerskolen (School of Arts and Crafts, Denmark). Between 1955 and 1957 he worked with Kay Kørbing then between 1957 and 1960 in the research department of Vilhelm Lauritzen. In 1962, he collaborated with architect Torben Lind. He teaches at the School of Arts and Crafts (Kunsthandvrerkerskolen) where he becomes rector of the department of furniture design in 1967 and is a member of the Danish Design Council (SDC) in 1977. His work is featured in numerous international exhibitions.